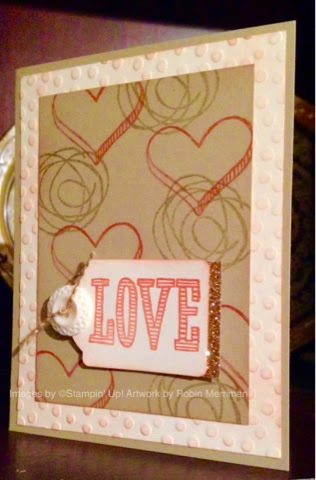 It's official, I'm in love with the Photopolymer stamps from Stampin' Up! Honestly, when SU! first introduced them, I wasn't a fan. 1) there is no pre-mounting needed. As in, no putting the sticker on the wood block, no placing the rubber stamp on the other side and praying it's lined up perfectly. No peeling off a paper backing and then attempting to perfectly position an image sticker in its place. Just open the case, peel the stamp off the image sheet, place on the acrylic block, ink it up and Stamp! 2) I love that I can see exactly where I'm stamping. Every. Time. And 3) I love that they are the least expensive option leaving me more crafting dollars for ribbon and bling! Folks, I literally sat down at my table, opened the stamp box, pulled out some pre-cut cardstock pieces and ink and designed this baby in 15 minutes. Crumb Cake, Whisper White, Calypso Coral, Crisp Cantaloupe and Gold Encore - a sweet and subtle color combo. The tag is made with the Note Tag Punch, Very Vintage Buttons, some Gold Glimmer paper and a piece of Burlap string pulled from a piece of our Burlap Ribbon. A couple of dimensionals pop it up off the card front. I used the Big Shot and my Decorative Dots Embossing Folder for the background and sponged the edges of everything with Crisp Cantaloupe ink. 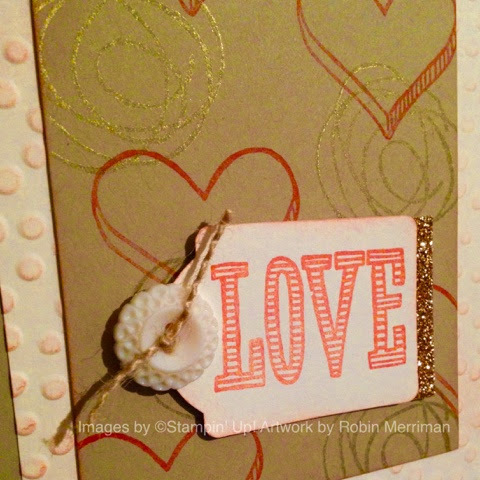 This card just makes me happy - and ready for Valentines' Day! To make it simple to shop, all you need to do is click on the photo of the product you need and you will go directly to my Online Store where you can fill your cart and check out. Don't forget the awesome Sale-A-Bration products you can choose from - totally FREE. 1 per $50 product purchase! Have a fun weekend stampin' friends - go create something amazing! Love is Kindness - NEW Stamp!